I was first introduced to Rammellzee through Henry Chalfant, the great photographer and witness to Rammellzee’s marriage. He, along with Martha Cooper, were very important figures within the 1980s New York graffiti scene. It was through them that I was able to reach out to Rammellzee and offer him to take part in the realisation of a project named ‘Collection Amour’, to be presented at the Grand Palais in Paris in 2009. The project entailed commissioning the best graffiti artists to each create a work on canvas of the same format and theme. When shown together these works would mirror a battle of letters. Rammellzee was very excited to take part in the project. Rammellzee’s interest in this collaboration stemmed from his drive to gain wider recognition for this art movement, particularly from the established artworld. While it had developed some momentum within American galleries during the 1970s and European ones in the 1980s, it had become difficult to engage a wider audience since. It all began in 2006 when he came over from New York, carrying photos and sketches under his arm, to settle into the ‘Ruche’ my studio in Boulogne-Billancourt. Over time our friendship grew, filled with great conversations, and a mutual respect. I think our rapport was based somewhat on our shared Italian background. It was then that he began to call me ‘Crazy Froggy’. During our epic evenings, over dinner and drinks, he would explain to me part of his philosophy – from then on his fight became my fight. We fought to revolutionise language, to educate the world on the Art of calligraphy, originated by the monks from Jumièges and Cluny, which is well illustrated in his work, Tower of Apparitors. 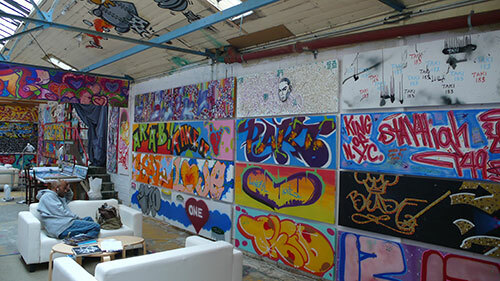 He spoke of a general ignorance regarding graffiti, how many did not know that it included mostly works on canvas created in the studio, different from the rapid street art style. I promised him that I would promote the movement internationally. Many months later, thanks to the indelible support of Yves Saint-Geours, the president of the Grand Palais at the time, we were able to create an exhibition that received more than 80 000 visitors. To my surprise, Rammellzee came, masked and in costume, to show his support for the exhibition. Though we were becoming closer, his sickness continued to gnaw at him. His jaundice became worse, and he always felt tired, but he continued to fight to spread his vision. During this time he sent me some of his best and early works and some that were more recent to reinvigorate the Rammellzee portfolio within the Gallizia graffiti collection. We spoke every day, but he very suddenly announced that he was terminally ill and wished to come to my studio to create his final piece, Atomic Note Maestro Atmosferic (2009) which he said was to be for the, ‘Crazy Froggy’. This was very touching and a great honour! Rammellzee also asked me to call Koor (B-One) and Toxic (C-One), the only survivors after the death of A-One, to work all together as a “crew” on a final piece. At the same time, Rammellzee finished Atomic Note Tag Minus 12% (2008), which touched on the feeling of time passing him by and slipping through his fingers. While he was in remission from his illness due to a new treatment, he was then able to complete Ransom Note on the Word Edge. In this painting he depicts an arm falling out of a tomb, which is a symbol of his resurrection, as well as a metaphor for the battle he would continue fighting. Some time later, while at home, he sent me an email which was a death announcement and a farewell to his art and personality. His final work Atomic Note Maestro Atmosferic (2009). The work depicts circular holes, which referenced the three holes in his liver, and instead of arrows he uses the arrows of the Eiffel Tower to represent his friendship with the ‘Crazy Froggy’, as well as the good times we had together in Paris. I would honour him everyday, from breakfast to dinner, by repeating the ritual of serving him three drinks with each meal. He signed the work ‘K1’, the Master of Masters, King since 1977 and represented his lettered-mask spaceship flying one last time through the universe. Today, carried by my confidence in and friendship with Rammellzee, I continue to collect and show his work, to fight for recognition of his philosophies. After contributing to the great exhibition Rammellzee: Racing for Thunder at Red Bull Art in New York, I was happy to lend my collection to Steve Lazarides for Rammellzee: A Roll of Dice, which opened for the public during Frieze London 2018. Thirty-five years after the exhibition at the Boymans Museum in Rotterdam, the show at Sydney Janis in New York and seven years after my first retrospective within the Grimaldi Forum in Monaco, the art of the Gothic solider is making a resurgence.